A poster in favor of the bear named Daniza, under threat of capture or suppression in Italy. 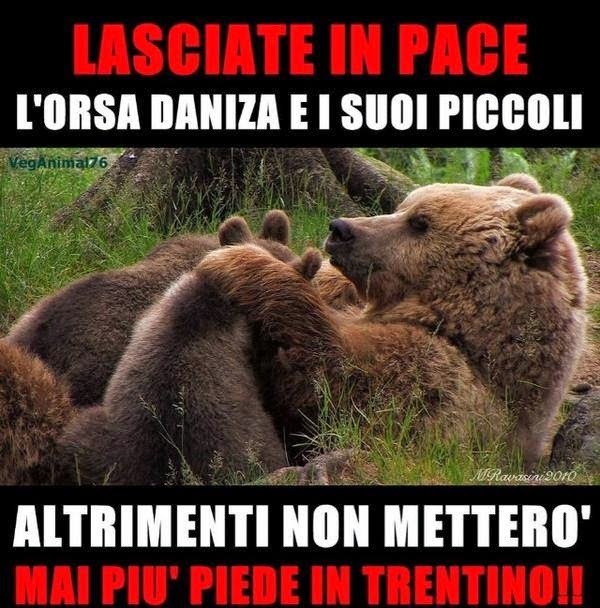 It says "Leave alone Daniza and her cubs, otherwise I'll never come back to Trentino" (Trentino is the Northern region of Italy where the story is unfolding). Killing and destroying everything which is not under direct human control is the origin of the disaster called "overshoot". As long as people will not realize that there are limits to the human appropriation of resources on this planet, nothing will change. The recent story of the bear called "Daniza" is typical of many stories of this kind. A few days ago, someone went looking for mushrooms in the woods of the Trentino region in Italy and stumbled onto this female bear and her two cubs. He wasn't smart enough to leave the place at the fastest possible speed, as he himself reported later. The alarmed bear decided to teach him a little lesson which, fortunately, left him almost unscathed, rather than consigning him to the records of the Darwin awards. Mother Daniza, apparently, limited herself to chasing the intruder away rather than using all her force against him, as she could have decided to do. The result: cries of "shoot the bear!". Immediately after the incident, local politicians and local newspapers all seemed to agree on the need of killing Daniza. After a considerable reaction against this idea on the Web, the local government limited the proposed action to capturing the bear; which would probably condemn to death her two cubs. As I am writing, they are still trying to capture Daniza but, so far, she has managed to remain free with her cubs. Despite the number of people expressing themselves in favor of Daniza and her two cubs, there remains the fact of this immediate and commonplace reaction: wilderness is a problem, wild animals are dangerous. Let's eliminate them and everything will be fine. Which is, after all, the way we tend to try to solve most problems: shoot or bomb the source of the trouble until (hopefully) the problem will disappear. This attitude is widespread and it is, after all, the main reason for the phenomenon we call overshoot. Recognizing no limits to their action, humans want to appropriate every possible resource of the planetary ecosystem. Whatever opposes this action is ruthlessly eliminated. They don't realize that they are dependent on the ecosystem, rather than the reverse. So, the over-appropriation of the natural resources depletes them to the point that they can't reform fast enough to replace the losses. The result has a name: collapse. Killing Daniza the bear and her cub won't cause the world's economy to collapse, but it is an indication of an attitude which is leading us exactly there. 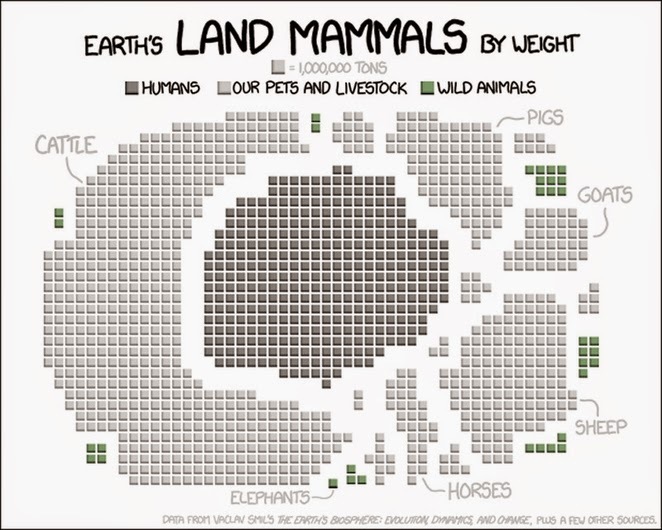 Here is a telling graph by xkcd showing how little wilderness has remained in the world. And we keep destroying it. Provincial cretins aren't they? But then, what are we......? Well, I read an interview with a fisherman - don't remember where he was from. They asked him, "but don't you know that the fish is running out?" And the answer was something like, "I know, that's the reason why a need to fish as much as possible as long as there are some left." Perhaps we just deserve to go extinct for mental deficiency? I do not think it is a matter of education or mental deficiency. I would agree that there is something odd about making such collective consenus. The wild has a symbolic content that differs according to cultural context. Luckily we cannot eat bears (though I am not sure about their use in so-called Trad Chinese medicine?). And status symbols for brave Victorian success stories - the rug in the study - are more Monty Python or passé than real these days. I think the bear and her cubs might just 'make it' if we make coalition. Like the presence of amphibians or wild tortoise along the Mediterranean they actually represent a healthy (or not) ecosystem. Call them indicator species for our own chances of 'making it'? PS I remember a wonderful bit of documentary film about an agrarian community in northern India who, having little enough themselves, fed 'for luck and sympathy' migratory Storks every year at a critical point in the Storks' migration.